A Gallon Of Bleach Really Cleans Out The Nostrils! George wasn't so in to this tonight, but he put up with it for a while from Kirstin today...if for nothing but the added attention he got from us. At the time of writing, I can actually smell other things again (not just bleach), but I was nearing the 'concerned' mark when I completed the job tonight and was unable to smell anything but bleach. It was like I was stuck at a pool...never to leave. I like pools, don't get me wrong. But I don't like living in them. Come to think of it, I've never tried living at/in a pool, but I'm pretty sure I wouldn't like it. Regardless, that's not the point of this post. I made the pilgrimage to the landfill (transfer station, actually) with the garbage that accumulates around here (that isn't burned (shhhh!) or recycled (yay!)). Basically that amounts to food scraps, diapers, and un-recyclable plastics. So it takes a while to accumulate to levels of filling the four cans and requiring a 'pilgrimage' to the dump. It's been just over four months (I checked -- last was April 28) since the last trip. Now I oddly enough like the garbage guy (that works on Saturday morning). Of all the trips I've made on Saturday mornings (generally with the same amount of waste in tow), I've yet to pay the same amount. He's a good old guy, but I think there's just a bit of 'I don't really care what you pay as long as you pay something close to what I think that's worth...' in his attitude. I'd probably be the same way if I worked there, though. Not exactly a glamorous job. Anyway, today's bill was $12 even. That comes to about $3/month, which far beats (no exceptions) paying for pickup service once or twice a month for $25 monthly (so I've heard -- I don't actually know for sure). And I do the free drop-off with the recyclable stuff monthly. And I get paid for the aluminum when that gets taken in since I have a 30-mile (one-way) drive from home to the collection place for that. So my happy trip to the dump has come and gone. Guess It'll be around the first of the year when my next trip takes place. I got home from that activity around 11 this morning, then read the paper. Ate some lunch, then went and took a nap. It wasn't a great nap; I had George laying right next to me and cleaning himself most of the time. I can handle this at night when he's by my feet, but he was laid against my arm, so his constant cleaning motions were keeping me awake. Ah well, it's over now, and I didn't bother to move him. Once I got done with that napping business, I decided to finally tackle the cleaning of the cistern. This is where the bleach comes in to play. I mixed up about two gallons of bleach water (about 1:1), grabbed a scrub brush, and went to town. The work sucked. In fact, if you ever have the opportunity to clean a concrete block wall with bleach and a small brush -- it'd be a good time to try base jumping instead. Yeah, I said jump off a cliff. It's not a pleasurable experience. It could've been a whole lot worse. As far as raw labor goes, it wasn't that bad. The work progressed fairly quickly, and the bleach water did an amazing job at cleaning up and disinfecting any sort of nastiness (of which there was definitely some) and mold that accrued on the surface of the block over a long period of time (keep in mind that this was a water tank at one point in time -- hence the mold and general nastiness). But the stink is something I didn't quite expect. I expected it to smell of bleach, but it really smelled of bleach and many other interesting things (I'm presuming the dirt and other organic material). Needless to say, even with the exhaust fan setup running again (similar to what I used to exhaust gas motor fumes out when we used the concrete saw), it still stunk like no other thing I've smelled before. So I coughed a lot at first (especially while working on the outside walls, which were the nastiest), but took many outside breaks and eventually rinsed off each wall and got the water sucked up with the shop vac. All told, the wall work itself (including breaks) took about two hours, for about 350 square feet of wall. I thought about quitting when I had about 3/4 of the wall work done, but I knew I'd never go back to finish it if I didn't stick it out. And that was true. So I finished the wall work (noted above) and got me some more bleach water (since my original two gallons was gone by the time I got to the floor), this time mixed in about a 1:10 ratio. The floor went pretty quickly, but that's because it's not much larger than one of the walls. I did another rinse job (with the shop vac) and put an oscillating fan on it all to help dry it out. I'm very pleased to say that as of 10PM, the cistern is dry and looks absolutely nothing like it did prior to starting the cleaning job. I'm also very pleased to say that I'm done with that particular job and hope to never need clean (in an enclosed room) like that again. In fact, it should be ready for painting soon. Then I can put some shelves up, get some lighting and outletry (yes, I made that word up) installed, and have a fully-functioning storage unit in the basement. Excellent. As a side note, I intend to also bleach-wash the rest of the basement walls as a step prior to painting and whatnot. But with one exception (there's another nasty area about 100 square feet in size), I won't be using the 1:1 bleach mix. That was some nasty stuff. But the house is starting to not smell of bleach now, and I'm leaving the exhaust fan in the basement window of the cistern to keep pulling air out in hopes of keeping it that way. But now that everything has dried, most of the really nasty (read: overpowering) bleach smell has gone away. Hooray! So that's one major project I've been putting off for some time that's now complete. So that's a Good Thing. That's about all I've got for tonight. I'm still intending to ramble about another topic, but it won't be tonight or tomorrow night either. In the meantime, I would just advise you to not use bleach in the way I (had to) today. Unless necessary. Here we are all strapped in to the car seat prior to leaving the hospital. She was more or less asleep at this time, but not quite completely asleep when we left. Look how the car seat simply absorbs her. So I feel like a real Flickrite now, at least a little bit more than before. 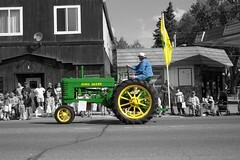 Someone flagged my John Deere H picture from yesterday's post (and submission on Flickr) as a favorite. Yay! It must mean I've done something right -- at least with that picture. Anyway, I spent some time meandering around Flickr looking for Tractor groups. Seeing as how I have several tractor pictures, I might have to do some group joining and spread the fun. Tonight I managed to look/skim through all 2,088 pictures I've got on Flickr. It took some time, but I managed to get through them all. In the process, I grabbed a few pictures (well, I grabbed the originals from my computer) to perhaps do some Photoshop magic with as an alternate. That's a big benefit to the Flickr thing -- I can figure out easily on what date an image was taken, then go to the original archive on my computer and quickly find the picture in question. We were all happy and ready to go this morning. Just missing the car in this picture. It's amazing what about five months does to a child. This is a similar picture to tonight's post picture, but different in that it was taken about five months after Kirstin was born. As opposed to two days. She's really grown quite a bit (and is getting larger still, as babies tend to do). So that's cool...and I thought I'd share it. As a last-minute tidbit tonight, this is officially post #200 here at the blog (since I started it). It's officially post #201 for the year 2007 (since I only had one prior to my February start date to import from the old system), but it's still an achievement. Go me. :) So here's to another 200, 400, etc. posts in the future. This is my artistic interpretation of the original image, in an idea I got from my old college advisor and the truck picture to which he did a similar thing earlier this summer. As I was looking through the parade pictures, this one stuck out as an excellent candidate for the process. I didn't do it with color range selection, but rather with some fairly simple layering (somewhat like a mask) in Photoshop. I really like how it turned out. So I took more time out of my evening to work on the aforementioned picture, which became tonight's blog picture. I really like how it turned out (and I like this version much better than the original). I managed to play some Super Mario World on the Super Nintendo tonight. Good times. I got into the third world (including all of the secret stuff of world two) before we ate supper and later got sidetracked while working on the picture. But, we had a pretty good supper. Managed to eat far more squash than I probably should have, but it was very much on the good order. I'm glad we have more (that's now been cooked)! I always have liked squash, but we don't all that often have it. Other than that, it's been a pretty quiet evening. We had just over 3/4" of rain between about 3:30 and 5:15PM tonight, and we've had more since then (although I've not gone to check the rain gauge since I got home tonight, so that'll be tomorrow). I don't believe it'll be much more than .1" or .2", but that's just based upon my observations tonight. Some rain is good, because I noticed the grass was starting to get a little brown in spots again. I should do some overseeding in some places here in the next two weeks or so, since this is really the best time to start growing grass. Time to mix up some roundup and tackle those tough spots, then seed some grass to cover 'em up. I discovered a product yesterday called EcoLawn. I don't have the link for it right off hand, but it apparently is a very deep-rooted grass that, due to its deep root structure, requires little unnatural watering and is very drought tolerant. Additionally, it's a fine-bladed grass, so at a certain height it falls over on itself. The sales pitch there is (in addition to being a slower-growing grass) that mowing can be less-frequent, because the grass only reaches a certain visible height. I'm not so sure I buy that part, especially if the grass doesn't grow consistently across or throughout the yard. You'll still end up with really lush patches and then the wiry ones. Mowing tends to help even out the look even if it's only temporary. On another random thread, I talked to my uncle over in Wheaton tonight for a few minutes. We're finally going to be getting together again -- this time on Sunday. Should be a good time, and I think we're both looking forward to heading over that direction for a few hours of entertainment. Kirstin will almost surely enjoy herself as well. I must've said something funny to her, because she was all full of giggles for a few seconds while I took this picture. So I unfortunately don't have much to share tonight about the day's happenings. It was a fairly normal Wednesday (except it feels like Tuesday due to the long weekend). I managed to do mostly paper design work today and not much actual code writing or the sort. In ways that's kinda nice, but redesigning a GUI (as opposed to doing web design) for a data management application isn't always an elegant process. Especially as the amount of collected data increases. This evening I spent some time reading the paper and doing some general organization stuff (filing, etc.). It's nice to get things cleaned up a bit on the old desk. It's still not perfect, but I don't expect perfect in that department. It's just not going to happen. Kirstin was having a bit of a time with her teething business tonight. She got better as it got closer to bedtime, but she was a bit of a bear for a while after I got home. It's interesting to be shown teeth marks in all of her spoons and stuff, though. Having been bitten by her a while back, I have no doubt that she's capable of making such marks in a baby spoon. I didn't take much more time to work on the picture that I was messing around with in Photoshop last night. I still intend to get to it this week if possible, and what I started doing is over half complete, so it shouldn't be too much longer (assuming I take the time to just do it). I really like how it's turning out so far, and I got the idea from a picture I saw on Flickr from an old professor of mine who did something similar (although using a different means). So we'll see how that goes. And since I don't have that much more to say (short of I also need to work on a print stylesheet and some other website-related stuff to mzonline), I'm going to call it a night. And showing off her cute little outfit before bathtime and bedtime. I also got a bit sidetracked tonight in working with pictures (and geotagging some), so I'm going to leave this post on the shorter order as well. But, I am trying something kinda cool with a picture that if I get some more time to work on it will display sometime in the next few days. That'd be neat. Our weekend was pretty busy. We spent most of the day Friday getting things done around the house. I spent a few quality hours outside mowing the lawn, an activity from which I received a bit of a sunburn. Not to worry, though, after a day or two it'd all faded out to my normal tan. So nothing requiring anything more than some aloe vera gel. The remainder of the long holiday weekend was spent at Beth's folks' place. In some ways it was nice to really not be doing much of anything, but in other ways it would've been nice to have some time to work on other projects here at home. Ah well, Kirstin got to meet her cousin Evan for more than a few hours and also got to see her uncle Josh for the first time. So that was cool. Also got to see some other people on Sunday. We went to the Bovey Farmers Day Parade on Monday, which was pretty cool. It was a really large parade -- I was quite surprised by that. I've got several pictures from it in a set over on Flickr. We discovered a very nice Chinese restaurant in Little Falls on our way home on Monday (Labor Day). I was quite impressed with the place, and if we have time in the future (and feel like eating Chinese) we'll have to stop there again on our long trek North. It's a good place to stop, being roughly halfway between destinations. Especially with Kirstin now. Today was back to the mill, which is always a bit difficult on the first day after a long weekend. It went alright -- but just slow as one would expect. :) I accomplished some neat things related to a pretty major database engine upgrade today, so that makes me feel a lot better about a track we're shooting for to make the entire scalable system completely Vista compatible. The app itself has no issue with Vista; it's actually the database engine that doesn't like it (or cannot be installed, more appropriately).